Clafoutis. You've eaten one. You've probably baked one. You've definitely heard of one. But can you define one? What is a clafoutis? It's not quite a cake or a custard or a flan or a pudding. It has been called lots of names, including "a baked fruit dessert," "a baked custard with fruit," "a crustless pie," "a fruit-fill flan," and my personal favorite, "a sweet frittata." Purists called it a flognarde, but that lacks the panache of clafoutis (pronounced cla- foo-tee). Clotilde Dusouslier, the charming Parisian food blogger, calls clafoutis "the epitome of the French grandmotherly dessert: unpretentious, easy to make, and blissfully comforting." Call it what you will, especially if you're high school French is a little rusty. Just be sure to make one. With its eggy base, I place clafoutis in the realm of custard rather than cake. This prized Limousin dessert is traditionally made with cherries though gets along equally well with fruits such as pears, apples, and berries of all sizes and colors. Although clafoutis can be enjoyed year-round, they're particularly partial to spring time when luscious fruits such as apricots, cherries, and strawberries are at their peak. Rather than vy for attention, the sweet cherries and tart blackberries complement each other, while the almond extract infuses the custard with a rich, smooth flavor. You could top the clafoutis with vanilla ice cream or a dollop of creme fraiche, but I wouldn't. Its most comfortable with a simple snowy white cap of confectioners' sugar. A note about using cherries in clafoutis: Purists claim that cherry clafoutis should be made with whole cherries, pits included, which impart a nutty almond flavor. I'm assuming those purists have not spent the fortune on Invisalgn that I have spent to get their perfectly straight smile. So I removed the pits (along with the risk of a chipped tooth) and added almond extract instead. To pit a cherry, you can use a cherry pitter. Or you can do it the old-fashioned way, like I do: Place the cherry on a cutting board. Place the flat side of a wide knife on the cherry and press gently until it splits. Open the cherry and remove the pit. 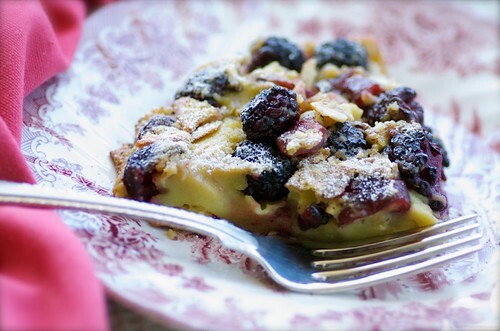 This recipe is adapted from two originals: Blackberry Clafoutis by Nicole Weston of Baking Bites AND Cherry Calfoutis by Garrett McCord of Vanilla Garlic (Posted on Simply Recipes). 1. Preheat the oven to 350 degrees F. Grease a 9-inch or 10-inch round baking dish with butter, or coat well with cooking spray. Toss in the cherries, blackberries, and slivered almonds. 2. In a large bowl, whisk eggs, sugar, flour, and salt until smooth. 3. Add milk, Amaretto (or almond extract, if using), and vanilla extract. Whisk until smooth. Pour into the baking dish. 4. Bake for 40-50 minutes or until puffed and lightly browned and a toothpick inserted into the center comes out clean. When you pull it put of the oven it will wiggle a bit which is normal. Place on a wire rack to cool. The clafoutis will have puffed up quite a bit and will deflate while cooling. When cool, dust the clafoutis with confectioners' sugar. Serve. I am craving some cherries, but the only bag I tried to buy was $13. I almost had a heart attack. Hopefully I can find some cheaper ones this week! That clafoutis looks heavenly! What a perfect combination! 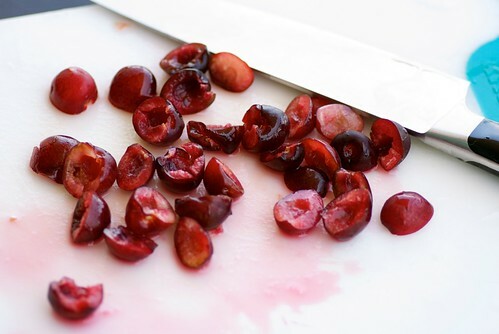 We still have to wait for cherry season till jully and hen i am sure gonna make them, looks really delish. The only thing I like better than eating clafouti is SAYING clafouti. Three times fast. Ohhh, yum, yum, yum, Susan! I was just craving clafoutis yesterday and with your blog post today, I think it's a sign. :-) Hope you had a splendid weekend! I'd like to know how eat a clafoutis with pits in it. Nevermind your teeth, how do you spit out the pits? Thanks for leaving the pits out:) Looks fantastic! I got a bag of cherries last week in my CSA, but C. and I ate them plain! Guess I'll have to get some more to make this lovely dessert. Oh, I love cherry clafoutis and I totally agree you don't need to leave the pits in. Just add some almond extract, like you did. Who wants to spit out pits? I have this cherry pitter and it's amazing: http://tinyurl.com/279epbx It makes pitting cherries so much faster! I have been into making savoury clafoutis lately but the combination of cherry and blackberries has me rethinking. Sadly, I've never made... nor eaten... clafoutis. I think it might be time to fix that. This looks amazing! jessica-Yikes! That's high. I paid a lot last week-- $8 per pound. This week I found them at a different farmers' markets for $7 for three pints. Good luck! happycook-Cherries are worth waiting for! unplanned-They do look pretty at a brunch. elaine-Thanks for the pitter link! val-And I'd like to try a savory one. So we'll have to switch! That looks so good! I do love cherry season. We planted two cherry trees in our back yard, but they are still young and haven't fruited yet. Hopefully in a year or two. 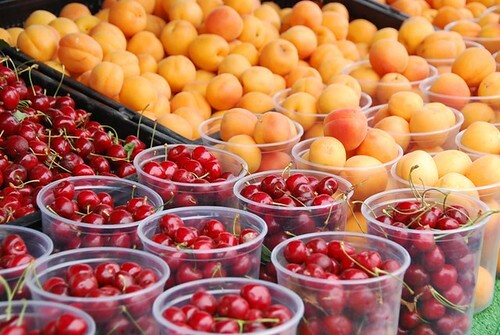 I wish cherries were more local for us! We're lucky to get them at the grocery, and then it's hit-or-miss as to whether they're delicious or just okay. When they're delicious, though, it's heaven, and I proclaim them as my favorite fruit. (of course, I do this every spring/summer when all of the best fruits ripen - yesterday I proclaimed peaches were my favorite, and two weeks ago, blackberries...I'm kinda fickle that way) Anyway, I think it's high time to make a clafoutis! My dad is a big cherry fan, so maybe this would be a perfect ending to a Father's Day meal. I made a strawberry clafouti on Sunday - ang also quoted Clothilde when I wrote it up. Hey, Susan...how long did you cook your clafouti? In the recipe as posted it says "cook for minutes." I know I can get the info elsewhere but thought I'd like to find out how long you baked yours. Thanks! You have a gorgeous blog and I recently chanced upon it! I am definitely going to be following it! Simply beautiful! Think I'll go ahead and give this a go with the cherries my son picked Sunday. Last year I tried my first clafoutis with peaches. Waaaaaaay too sweet, but loved the idea. Perhaps with the cherries the sweet / tart balance will be right. There are lots of cherries out there now so I must try this clafoutis since I have never made or had one. It looks delicious. Wow! This looks wonderful. And with so little flour in it it looks like it would convert easily to being gluten free without much thought (I am not much of a gluten free baker). Oh, wow! I've been anticipating blackberries from the farm in just a couple of weeks - and I was just thinking the other day, "What about a blackberry clafoutis?" tastyeats-Oh, yes! Surrprise him for Father's Day. My mom just made one for my dad a couple of days ago and he loved it. PS- I know what you mean. I fall in loved every year. meredith- Whoops! I added it couple of days ago. 40-50 minutes. Thanks! ruchi-Thank you for your kind words. I will! livinlocal-This one wasn't too sweet for my taste. Maybe it was the fruit. Let me know if you like it beter. theteachercooks-Well, you've got to make one then. Seems everyone on the blogosphere is on a clafoutis kick! beyondricenadtofu-I haven't made a GF version, but it seems like it work well. Good luck! TW-Yay! Perfect timing then. Enjoy! What a great pair! I've made clafoutis in the past, but never with blackberries--love the look and sound of this, especially now that the farmer's markets are overflowing with cherries. This looks so beautiful that it wants me grab that plate right now. Bookmarked. I will have to make this before summer disappears. Made the claufotis with bing cherries and apricots. what a fabulous recipe. Thanks Susan.